The team of 'Judwaa 2,' including Varun Dhawan, Taapsee Pannu and Jacqueline Fernandez, have been quite busy shooting for their upcoming film. As the team has wrapped up the final leg of the shoot, they are now flying to Mauritius to recreate Salman Khan and Karisma Kapoor's Tu Mere Dil Main Bas Ja song. 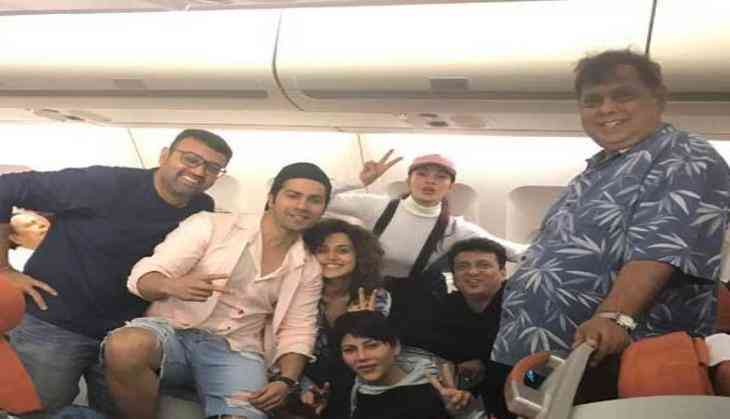 The film's lead actor Varun Dhawan took to Twitter and posted a photo of the entire star cast heading to Mauritius. He captioned the snap, "It's a wrap last sched of #judwaa2. The entire gang is here #love #Mauritius. The original was also shot in Mauritius so we had come back." In the pic, we can see the entire star cast along with David Dhawan in a mid-flight. The film, which is a sequel to the 1997 blockbuster 'Judwaa' starring Salman Khan, Karisma Kapoor and Rambha, is being directed by David Dhawan and also stars Jacqueline Fernandez and Taapsee Pannu in pivotal roles. Recently, the 'Badrinath Ki Dulhania' star also shared a video on Instagram of himself from the sets of 'Judwaa 2'. In the video, Varun was shooting for the movie's climax scene at a studio in the city. The flick is all set to release on September 29.